If there’s one topic that gives Swirl knitters trouble, it’s gauge. I have been finding that using the traditional methods of knitting and measuring 4” swatches to assess gauge has been leading Swirl knitters astray, most often resulting in Swirls that are too large – and use too much yarn. I’d like to take you step-by-step through a process I think will help. If you will be substituting a yarn for the original, I recommend that you review the tutorial Technique: Choosing a Substitute Yarn LINK before continuing with this tutorial. Let’s take a moment to think about the Swirl form. The dominant element of a Swirl is the welted circle or oval that provides the collar, lapels, front sides, and lower back of the garment. During blocking, the circle/oval expands outward, widening the space between the welts and causing the stitches within the circle to enlarge. When worn, the stitches in the circle/oval and back/front bodice will change again, narrowing and lengthening as gravity comes into play. The stated gauge in your Swirl pattern reflects gauge as worn—i.e. after washing, blocking and gravity have come into play. The level of resilience (elasticity/memory) of the yarn(s) in use will determine the degree to which these forces affect gauge. Step 1: Use the suggested needle size* and knit a large swatch. Bind off all stitches. 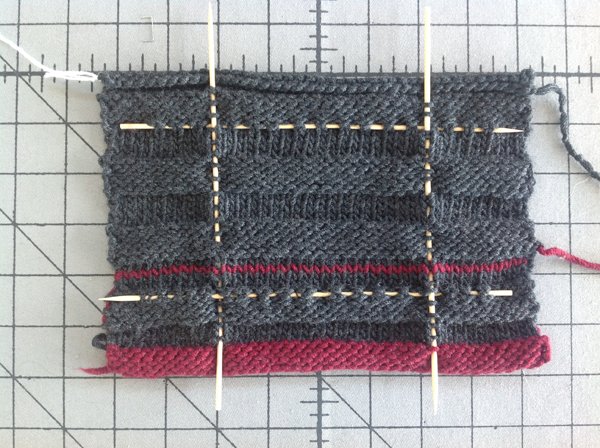 At this point, DO NOT expect the swatch to measure 8” in either direction (stitches or rows) on the needles or off. *Note on needle size: the size listed in the pattern is the size I used when I knit the original. I am a very tight knitter. Ergonomically speaking, this is not a virtue. If you have tendencies in the other direction, you probably have happier hands, but you should probably knit your first swatch with a needle one size smaller. Review the chart below to confirm that your swatch is performing as expected. If corrugation is less than as described, this is an early indication that your gauge is too loose. No real corrugation to the welts; well-defined ridge between welts. Step 2: Wet block your swatch. Thoroughly soak your swatch in warm water, squeeze firmly in a towel to remove as much water as possible. Lay it flat on a folded towel on a firm surface. Pat into shape. DO NOT tug, overtly flatten or try to match any measurements at this point. Just pat into a rectangle with straight welts and let dry completely. Review the chart below to confirm that your swatch is performing as expected. If corrugation is less than as described, this is an indication that your gauge is too loose. Mildly corrugated welts with a well-defined ridge between welts. No real corrugation to the welts but still has a well-defined ridge between welts. No corrugation to the welts and no well-defined ridge between welts. Step 3: Prepare for measuring. Gather up four thin bamboo skewers (inexpensive and available in most grocery stores; smooth the points with a soft nail file) or long double pointed needles (dpns) in any gauge that will fit easily through the stitches without stretching the swatch. About 2” from the left edge of the swatch, thread one of the dpns or skewers (let’s call them sticks) through the same stitch column from top to bottom of the swatch. Count stitches from stick to selvedge at top and bottom to make sure you’ve stayed in the same stitch column. Starting from the first stitch next to the stick, count the stitches necessary for a 4” swatch. (Use the number of stitches stated in your pattern for the 4” gauge swatch.). Thread a second dpn in the next stitch. Count stitches from stick to selvedge at top and bottom to make sure you’ve stayed in the same stitch column. The stitches necessary for a 4” swatch will lie between these first two dpns. About 2” from the bottom of the swatch, thread a third dpn through the stitches of the row just below the ridge of a new welt. Starting from the first row next to the stick, count the rows necessary for a 4” swatch. 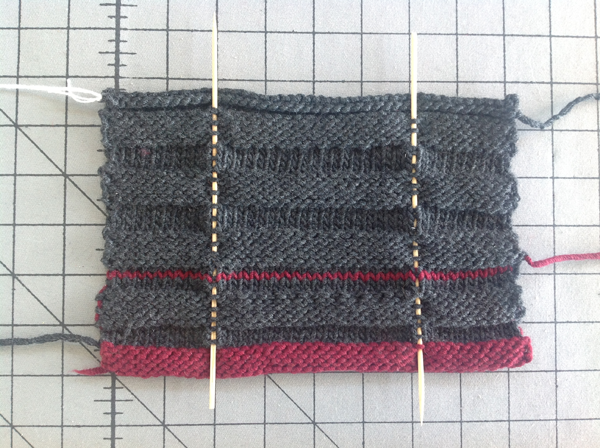 (Again, use the number of rows stated in your pattern for the 4” gauge swatch.) Thread the 4th dpn in the next row. The rows necessary for a 4” swatch will lie between these last two dpns. Step 4: Measure your Swatch. Measuring your swatch will be a slightly different process for each of the Yarn Characteristic Categories. Secure the top dpn with pins at the top corners placed 4” apart. Pull down on the bottom dpn until the distance on all sides of the gauge frame is 4” and pin. No stretching (or squishing) should be necessary to achieve stitch gauge, but some stretching (about ½ inch) should be necessary to achieve row gauge. If the fabric between the vertical dpns is loose and does not lie completely flat, knit a new swatch on smaller needles. If stitch gauge is good, but no stretching was necessary to achieve row gauge – double check the number of rows measured. If the row count is correct but no stretching was necessary to achieve the 4” measurement, then your yarn may have the wrong characteristics for this category of Swirls. Slight stretching (about ¼ inch) should be needed to achieve stitch gauge and (about ¾ inch) should be needed to achieve row gauge. In this category, if you have too many stitches and/or you don't have to stretch to achieve row gauge, the finished Swirl will probably be too big. If the fabric between the vertical dpns is loose and does not need to be pulled taut or stretched slightly, knit a new swatch on smaller needles. If stitch gauge is good, but little or no stretching was necessary to achieve row gauge – double check the number of rows measured. If the row count is correct but no stretching was necessary to achieve the 4” measurement, then your yarn may have the wrong characteristics for this category of Swirls. Adjust bottom dpn until the distance on all sides of the gauge frame is 4” and pin. Category 3 fabric is unique in that it is tender and tends to relax completely during blocking. It should achieve gauge without pulling or squishing. If the fabric between either the vertical or horizontal dpns is loose and does not lie smooth and flat, knit a new swatch on smaller needles. A little stretching to achieve row gauge in Category 3 swatches is acceptable if high silk content is present. Must stretch swatch in both directions to achieve both stitch (about ¼”) and row gauge (about ¾” - 1”). In this category, if you measured the stitch gauge on the post-blocked swatch without measuring sticks or stretching, the stitch gauge will have too few stitches and too many rows. If substituting silk without beads, consider as Category 2.